Our LKS2 pupil all know and understand a great deal about life in our country during the war. They put on a wonderful play for us about an evacuee called Harry. Life was tough for children sent away from the cities. Some women became Land Girls - working on farms. Well done LKS2.A excellent demonstration of learning. We'll meet again - don't know where...? Our Young Pioneers were evacuated as part of our rememberance of the war years this week. They were given a list of items to be packed into their pillow case. Some struggled to carry all their worldly goods. Our teachers were evacuated with us. When we arrived at our destination we were informed of the dangers of attacks by German bombers up the Tyne. A ministry of defence boffin told us about our secret mission. We were paraded around the church and Father Alun selected two pupils to live with him and his wife in the vicarage. These pupils were particularly clean - a nail inspection was vital and clean teeth also! The girls were asked to show their hankerchiefs as previous evacuees had been poorly behaved. The vicar asked if the pupils could look after the church and to do duties. Walking the dog everyday was top of the list. Then we had a wartime snack. Major Tom told them about aerodymanics. We were asked to send secret messages via pigeon. Then sent to a contraption away from enemy eyes. We then looked at a model V2 rocket. The V2 flew down on wires. We were told about the V2 menace. Our army officer cooked us up a wartime meal. We opened our letters from home - very sad! Then the V2 was sent down for testing. We aimed at the target - direct hit! We had a talk on gas attacks. Would you have enjoyed life as an evacuee? We prepared an Egyptian banquet for our thirsty slaves! We had an afternoon of activities - including mummification for beginners. We encouraged all our pupils to taste the delights of the Egyptian harvest. We included dates, figs, radish, red onion, barley to name a few. Everyone was encouraged to try a bite. Some were less inclined to taste everything. Some would have starved for sure! Remembrance Day seemed an appropriate time to unveil our artwork as part of our 'Flanders Field Exhibition'. We invited Mr Chandler (an ex-soldier); Mrs Tinning (Chair of Governors); Mr Roberts and Mrs Armstrong (ex-Chair). Mrs Broderick provided some beautiful music and our pupils ushered our guests and told them about our work. Our pupils assembled in the hall with our teachers to pay their respects to those who fell in the Great War. Each pupil brought a poppy to represent a soldier. Mr Chandler was once a soldier – he came in to help us with our remembrance ceremony. Mr Outterside told us about a battalion of soldiers from his village and our pupils read poems. We held our poppies as Mrs Broderick played a lament on the violin then we all fell silent. Our display contained writing and pictures of our school trips to Belgium to see the sites of the Great War. 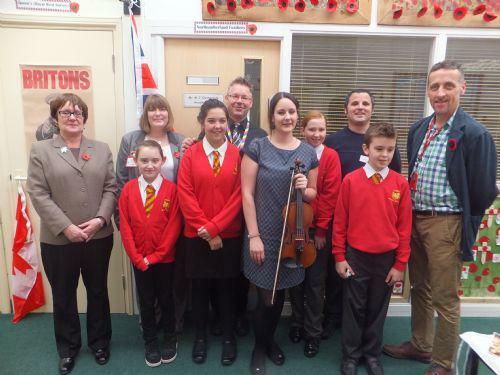 Our work of art was ready to unveil – Mr Roberts had designed the tribute and all our pupils contributed a poppy. They used acrylic paint – some were finger prints and others were painted. Our pupils observed and listened from the hall. Mrs Broderick led Mrs Tinning (Chair of Governors); Jen Armstrong (ex-Chair) and Mr Chandler down to the gallery. We all listened to the words. The pupil’s work was unveiled by Mrs Tinning and Mrs Armstrong. A worthy piece of art that will be a lasting tribute. Each poppy representing a soldier. We posed for pictures after the ceremony. Well done Mr Roberts and our pupils. Each poppy a different pupil. The poppy field began to fill up. All the classes contributed poppies. Our new curriculum involves looking closely at different pieces of historical evidence. These pupils are looking at artefacts belonging to their relatives who were involved in the Great War. Our 'big art' project also tells us what life was like in the trenches. This can be seen at the Cathedral and then in our school gallery. 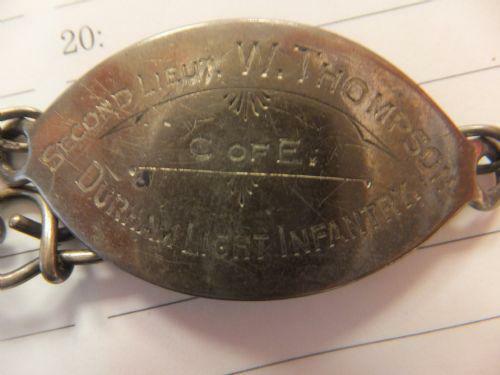 It is important to look closely - can you see who this belonged to and where they were from? It was a sad day for the children of Waverley who were sent away to Beamish to keep them safe from the Luftwaffe raids on Newcastle. Some of the children were sick on the journey - they had never left home before. Each child carried a gas mask, a teddy, their lunch, an ID card and a name tag. They travelled by bus to the farm where they would spend the war. We had to make sure all of the lights were dimmed as we prepared for our first night away from home as evacuees. Some were excited but others looked worried. Home Farm would be their destination. Food was plentiful but they had to work for it. They were prepared to dig for victory. We made our beds with hay and wrote letters home. The Air Raid Precautions man inspected our blacked out building. We were lucky to have a visit from Ada Kennedy - she came to tell us about life during the war. She was just starting school when war broke out but she was not evacuated. The classes enjoyed talking to her about life during wartime. We had to prepare questions to ask and listen to the responses. We had a look at her identification book - have alook at the podcast pages to hear her tales. 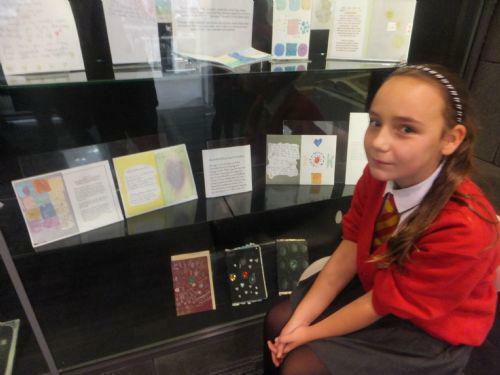 Some of our older pupils visited an exhibition of our work at the Central Library in Newcastle. Our year 5/6 classes worked with artist Effie Burns on the project. You can see our 'gospels' exhibited and we were also shown how our artwork would look once it was fired in the glass kiln. We also had the opportunity to contrast the gospels with other exhibits at the library. We also viewed some interesting South African art. We were visited by a Tudor lady. We ate soup prepared by our Tudor cook. We designed our own Tudor homes. We made nosegays full of herbs and also created our own marzipan Tudor roses for the King's feast. What a super learning day for us all! A beautifully appointed Tudor House has come onto the market. The house has a jetty so that your ground rent will be cheaper and useful for sheltering under in the rain. Windows are the latest fashion for the most up market properties. You will be able to look outside and not catch a nasty chill. Other features include a thatched roof and the finest timber supporting the structure to keep you away from the grime of the open drains on the street below.